Pakistan was born out of spite and intolerance towards India. Its founding fathers had staked their claim for a separate country for Muslims on the plea that they could not live safely in a Hindu-dominated society. Pakistan’s formation has not done its people any good even though the state is monotheistic. Pakistanis wrongly nurture a belief that Kashmir belongs to them and India should give it to Pakistan without any reservation. And it calls Kashmir an unfinished agenda of partition. Immediately on its formation, Pakistan forcibly occupied swathes of territory of the Indian state of Jammu and Kashmir while an unwary India was preoccupied with coming to terms with its newfound status of a free nation. While illegally occupying the forcibly taken territory, Pakistan has been surprisingly clamouring for the whole of Kashmir. India’s policy on Kashmir is irrevocable as Kashmir is an integral and inalienable part of the country. As such, the parts of Kashmir under Pakistani occupation should be returned to India. After three major wars and several skirmishes over Kashmir, Pakistan finds itself in gridlock, with no solution in sight. Despite blustering its way into becoming a sovereign country, Pakistan has failed to exorcise its ghosts. Democracy in Pakistan is a non- starter. The State being precariously wedged between rigid religious dogma and a series of back-to-back military dictatorships, Pakistan’s economy floundered, faltered and simply failed over the years. Financial assistance and aid packages from friendly countries and international financial institutions were diverted and pumped in to inflating its war machine, which was already far too disproportionate to itsdefence requirements. Pakistanis lagged in every segment of economic and social progress. The Army, and its intelligence agency, the ISI, lulled them into a state of complacency by playing out the bogey of a hostile India and bragging about Pakistan’s superior armed strength to trounce the enemy. Pakistan’s repeated attempts to militarily annex Kashmir have failed. So have its diplomatic manoeuvres in the international fora. All the wasteful expenditure on military campaigns has put its economy way behind India’s. Late Zulfikar Ali Bhutto of Pakistan once vowed to wage a thousand- year war against India. In reality, how- ever, Pakistan has been defeated in every single war it has waged. Licking its war wounds and diplomatic reverses, it has adopted the doctrine of “bleeding India with a thousand cuts” by means of covert and low-intensity warfare with militancy and infiltration. In the meanwhile, Pakistan could not last even a quarter of a century as a united nation. At the end of a suicidal war with India, necessitated by count- less crimes and atrocities committed by Pakistan against its own people in its eastern wing, Bangladesh was liberated, and Pakistan became a truncated nation. This became yet another cause for Pakistan to become more vengeful and export terror to India. Pakistan has settled for a proxy war with India. Littered on the terrain of Pakistan Occupied Kashmir (POK) are camps of terrorists who are trained and prepared by ISI for infiltrating into India and causing damage to military assets and civilian population and property. Many of these camps and the terrorists receiving training there have been wiped out by Indian forces in surgical strikes carried out in the post-Uri and post-Pulwama terror attacks. Although the resultant loss was considerable, Pakistan would not give up on its foolhardy terror campaigns despite India’s stern warnings. Besides not letting its guard down and not resting on its laurels, India needs to do a lot more. A welcome development in the wake of the Pulwama terror attack was an offer by Israel to support and aid India in its fight against terrorism. This development was expected due to steady progress in India-Israel bilateral relations. Many meaningful and insightful deliberations at the level of top leadership have gone into making mutual cooperation between the two countries in obliterating terrorism, viable and more realistic than in the past. 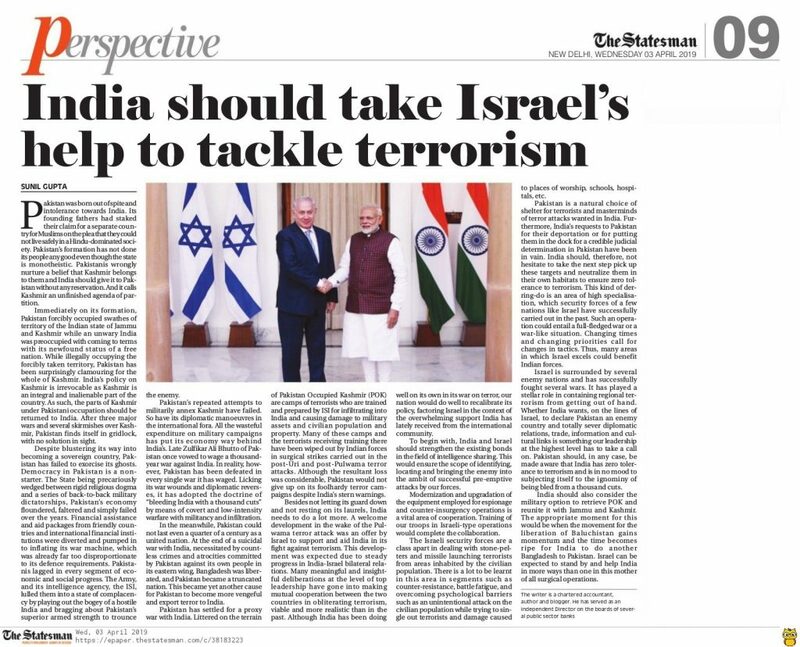 Although India has been doing well on its own in its war on terror, our nation would do well to recalibrate its policy, factoring Israel in the context of the overwhelming support India has lately received from the international community. To begin with, India and Israel should strengthen the existing bonds in the field of intelligence sharing. This would ensure the scope of identifying, locating and bringing the enemy into the ambit of successful pre-emptive attacks by our forces. Modernization and upgradation of the equipment employed for espionage and counter-insurgency operations is a vital area of cooperation. Training of our troops in Israeli-type operations would complete the collaboration. The Israeli security forces are a class apart in dealing with stone-pelters and missile launching terrorists from areas inhabited by the civilian population. There is a lot to be learnt in this area in segments such as counter-resistance, battle fatigue, and overcoming psychological barriers such as an unintentional attack on the civilian population while trying to single out terrorists and damage caused to places of worship, schools, hospitals, etc. Pakistan is a natural choice of shelter for terrorists and masterminds of terror attacks wanted in India. Furthermore, India’s requests to Pakistan for their deportation or for putting them in the dock for a credible judicial determination in Pakistan have been in vain. India should, therefore, not hesitate to take the next step pick up these targets and neutralize them in their own habitats to ensure zero tolerance to terrorism. This kind of der- ring-do is an area of high specialisation, which security forces of a few nations like Israel have successfully carried out in the past. Such an operation could entail a full-fledged war or a war-like situation. Changing times and changing priorities call for changes in tactics. Thus, many areas in which Israel excels could benefit Indian forces. Israel is surrounded by several enemy nations and has successfully fought several wars. It has played a stellar role in containing regional terrorism from getting out of hand. Whether India wants, on the lines of Israel, to declare Pakistan an enemy country and totally sever diplomatic relations, trade, information and cultural links is something our leadership at the highest level has to take a call on. Pakistan should, in any case, be made aware that India has zero tolerance to terrorism and is in no mood to subjecting itself to the ignominy of being bled from a thousand cuts. India should also consider the military option to retrieve POK and reunite it with Jammu and Kashmir. The appropriate moment for this would be when the movement for the liberation of Baluchistan gains momentum and the time becomes ripe for India to do another Bangladesh to Pakistan. Israel can be expected to stand by and help India in more ways than one in this mother of all surgical operations. Pakistan will remain a regressive country till they pursue terrorism. Imran Khan should take the lead and bring the country out of clutches of ISI and terror organisations operating freely in the country. It is a two-way relation between Israel and India. Both have many things to offer. If Israel has weapons expertise then India has intellectuals in computer science and pharma sector. Israel is such a small territory but even Saudi and Iran fear this country. This is because they have technology for defence equipment and the Israeli army has shown its valour in numerous wars in Middle East. Prime Minister Modi must try to woo Kashmir inhabitants by bringing them in the mainstream. More and more youth of Kashmir should be encouraged to come to Indian metros like Delhi and Mumbai. Kashmiris have two options. One is to side with Pakistan that is a terrorist hub and the second is to fully integrate with India which is a great economic power in the world. Wise to choose India. Why is Modi not talking to Pakistan? Does the BJP party believe that by not having a dialogue we can resolve the issues? This is only further deteriorating the relations with no rapproachment in sight. Indians must look at how Pakistan has become a failed nation. By concentrating on religion and conservatism they never let economy and prosperity grow. India needs decisive leader and PM Modi has competence. Had it not being the Indian National Congress’s surrender to Muslim League, Pakistan would never have become a separate Muslim country. Congress even today is a party of appeasement. Israel understands India’s concerns and this is the reason they have being sharing their defence technology with India. Visits by heads of both nations have further strengthened the ties and yield good outcomes. India and Israel share similar concerns. Both countries are surrounded by enemy nations and in order to ensure security of their borders and people both should work in tandem.